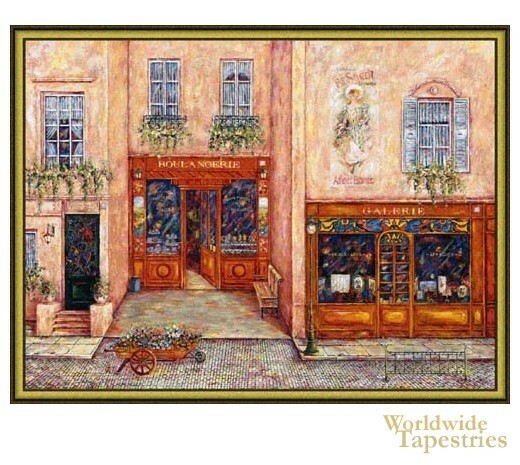 This Sagot Terrase tapestry shows a charming cityscape scene from Paris. Here we see a charming barrel of flowers outside a Boulangerie or bakery and a Gallery. The residents of the street are living on the floors above, with flowers and greenery decorating the windows. This rustic scene celebrates the importance of gorgeous shops which contribute to the social life or Parisians. This Sagot Terrase tapestry is backed with lining and tunnel for easy hanging. Note: tapestry accessories, where pictured, are not included in the price. Dimensions: W 70" x H 53"